Join a spectacular cruise with Hurtigruten along the coast of Norway. Short and long cruises are available all year, and every season has its charm. The cruise packages on offer include the complete journey from Bergen to Kirkenes and back with Hurtigruten, as well as shorter cruises lasting from one to six nights. For 90 years Hurtigruten was the most important communication link between the north and south of Norway, transporting mail, cargo, and passengers. Hurtigruten means "fast route" and, regardless of the weather conditions, it was the quickest and most reliable passage into the remote lands of northern Norway. Indeed it was not until 1983 that the mail delivery was finally entrusted to road and air routes. Hurtigruten has a fleet of 11 ships sailing along the coast of Norway from Bergen in the southwest to Kirkenes in the northeast. The full journey from Bergen to Kirkenes and back takes 11 nights/days, but it is also possible to board the ship for shorter cruises along the coast. Today, a cruise with Hurtigruten is a breathtaking experience; a glimpse into the Norwegian coastal life and traditions, as well as a front-row view of the majestic Norwegian scenery. The northbound cruise from Bergen to Kirkenes is often referred to as the cultural cruise, as it allows more time in the towns along the coast. The southbound cruise, on the other hand, is the nature cruise and allows more time for scenic experiences, i.e. Vesterålen and Lofoten Islands and Helgeland Coast during the daytime. Highlights in summer include Hurtigruten&apos;s detour to the Geirangerfjord and experiencing the midnight sun. The breathtaking Geirangerfjord is considered to be the jewel of the Norwegian fjords, and in 2005 it was included on UNESCO&apos;s list of world heritage sites. The narrow fjord offers numerous waterfalls, as well as mountain farms situated high up on the mountainsides, in places you will be amazed that people and livestock could survive. The cruise to the Geirangerfjord is possible from mid-April to mid-September. As the Hurtigruten ship crosses the Arctic Circle in Northern Norway, you will enter the land of the midnight sun. From the end of May to the end of July this is where the sun never sets. Imagine cruising along the beautiful coast in the middle of the night with the sun low on the horizon. Feel the energy from the sun and join activities under the midnight sun. Tour suggestions: Midnight Sun Tours & Cruises. A spring cruise with Hurtigruten offers the possibility to experience three seasons in one cruise; from almost full winter in the north of Norway, to spring and close to summer in the south. From mid-April, the Hurtigruten cruise includes a detour to the Geirangerfjord and until the end of April you can visit the Snow Hotel in Kirkenes and go dog sledding. 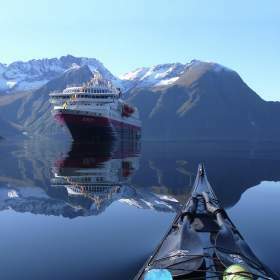 Tour suggestions: Hurtigruten Spring Cruises. Winter is an exciting time to visit Norway. Thanks to the Gulf Stream almost all of Norway&apos;s coast remains free of ice throughout the year. The Hurtigruten cruise connects several exciting winter locations along the Norwegian coast, such as Tromsø, Kongsfjord and Kirkenes. These are all located above the Arctic Circle and offer excellent chances of spotting the northern lights. In combination with your cruise, you can also experience exotic winter activities, such as dog sledding and snowmobile safaris. Tour suggestions: Norway Winter & Northern Lights Cruises. The autumn is the most colourful season to travel. You will experience the Norwegian coastline when nature is an explosion of colours; the sea is deep blue, the first snow has capped the mountain peaks and the mountainsides gleam golden, red and orange. Until the middle of September, the cruise also includes the detour to the Geirangerfjord. Tour suggestions: Hurtigruten Autumn Cruises. The autumn is the most colorful season to travel. You will experience the Norwegian coastline when nature is an explosion of colors; the sea is deep blue, the first snow has capped the mountain peaks and the mountainsides gleam golden, red and orange. Until the middle of September, the cruise also includes the detour to the Geirangerfjord.